In the fall and winter my favorite thing to make with dinner is oven roasted veggies. After I pull them out I leave the oven door ajar and enjoy the warmth in the kitchen. In the summer I NEVER make them because the sun is providing me so much warmth out here in Phoenix that I don’t need anything else to warm me up. Often times I just do them with salt, pepper and olive oil roasted until tender at 400 degrees. Those are the nights I am keeping it simple and with 4 kids and lots of activities simple is the name of the game around here most nights. This roasted cauliflower takes only a couple more steps and it is seriously worth each and every tiny step. Begin by breaking down your cauliflower into bite size pieces. Place in a large bowl and put olive oil on top. Finely dice or grate garlic and put on top of cauliflower. I love to use a grater like this one to dice my garlic. It makes it so easy to do and you have super fine garlic every time without anyone running into a chunk of garlic. Squeeze in the juice from one lemon and add salt and pepper to taste. 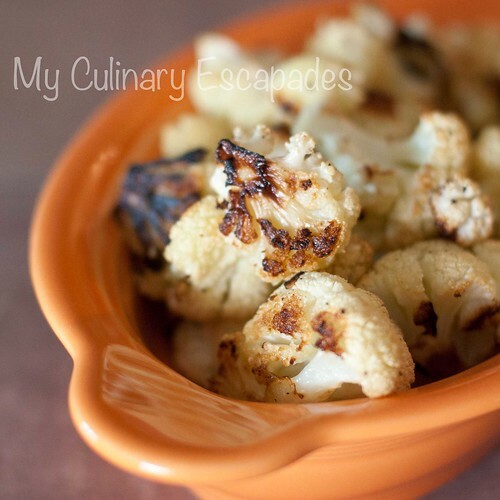 Place cauliflower in a single layer on a large baking sheet and place in oven. Bake for around 30 minutes. Just like when you steam veggies you are going to want to open the oven from time to time to poke a fork in the cauliflower to see if it is done. Depending on how big your cauliflower chunks are it can take anywhere from 20-40 minutes to cook. My Mother cannot stand parmesan cheese so whenever she is over I skip this last step, but if you like the tang of parmesan cheese do this step. Even if you don’t like parmesan cheese try it on a little bit, you may surprise yourself and like it. As soon as you remove the cauliflower from the oven sprinkle with 1-2 tablespoons of parmesan cheese and stir to coat.